Preheat oven to 300°F and line a baking sheet with parchment paper or a silicone mat. Set aside. Line a large plate with paper towels and set aside. Heat 3 inches of oil in a large saucepan to about 375°F. Welcome to a lesson in “How to Turn a Mistake into a Masterpiece 101.” Take a seat, let’s get started. My example for today is Churro Fries. Crispy on the outside, chewy on the inside and bursting with sweetness, they are impeccably delicious. And yet, mine were initially a blunder. Before my recipe turned into the magical creation that it is today, it was intended to be something different. If you’re not catching my drift here, these churro “fries” were not meant to be fries at all. 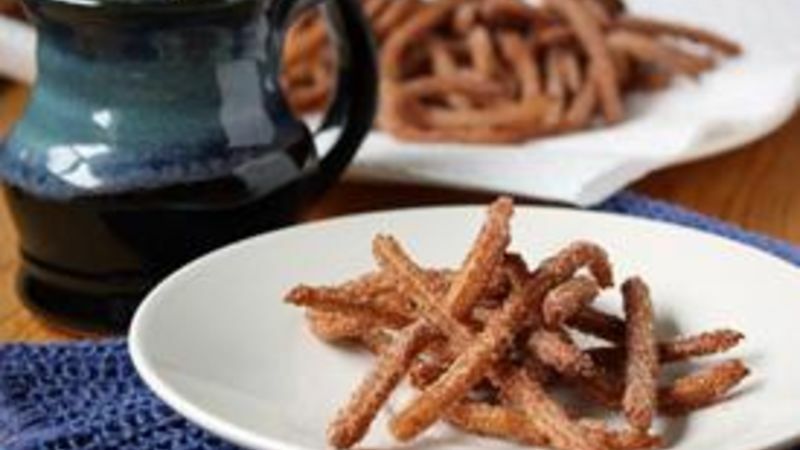 Sure, they were meant to be made into warm, deep-fried pillows of deliciousness, but as churros — actual churros — not as crispy, cinnamon-sugary strings. But here’s the rub – these are still insanely amazing. I’d even daresay they’re better than regular churros, but perhaps only because they’re unique and eating an entire churro gives me a stomachache (perhaps that’s also because I tend to devour them before riding a bazillion carnie rides at the county fair, but that’s beside the point). They’re like the bite-size, cuter and more fun cousin of churros that churros get jealous of when they steal all the attention. They’re crispy and deep-fried and sweet and yummy and I don’t care who knows it! Anyway, my point here is that sometimes you’ve got to roll with the punches. Even when the star tip on your pastry bag is the size of an eraser instead of a penny and you want churros, you can make it happen. Sure, they might not be what you’d expect, but hey, aren’t most things? In the end, what was considered a mistake might, in fact, be a stroke of accidental genius. Or perhaps just a tasty mistake. Either way, my tummy is happy. And whether you make these the right way or the “wrong” way, yours will be, too.